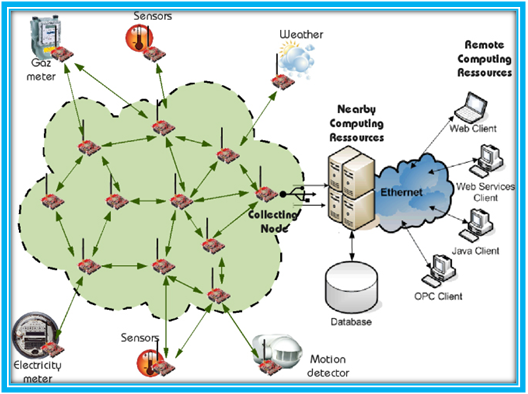 Wireless sensor network is commonly defined as, Sensing + CPU + Radio = Thousands of potential applications. OMNET++ CODE FOR WIRELESS SENSOR NETWORKS provide a bridge between the real physical and virtual worlds.Wireless Sensor Networks using omnet++ code allows the ability to observe the previously unobservable at a fine resolution over large spatiotemporal scales. Radio used for transmitting the acquired data to some storage site. Sensors for temperature, humidity, light. Memory used for the program code and for in-memory buffering. Processor in various modes like idle, sleep and active. Enable new knowledge in scientific filed. High confidence transport and assest tracking.
. Enhanced safety and security. Sample OMNeT++ Code for Wireless Sensor Networks.